At one point in my newfound hunting life, I needed to go to boot camp. No, not the Army type, but a place where I could have enlisted the help of trained boot-fitting specialists to teach me the ways of outfitting my feet for hiking and hunting in the Ozarks. In fact, I just had committed a big no-no in the footwear world – I stuck a pair of specialty insoles into my previously worn hunting boots without first trying the two together. I then compounded the problem by leaving my nylon socks on, because I was just going scouting for an hour in the woods. So, it’s really not the boots that were the problem … or the insoles … or the socks – but, a combination of all three. I hobbled the next day through the woods with huge blisters on my heels. 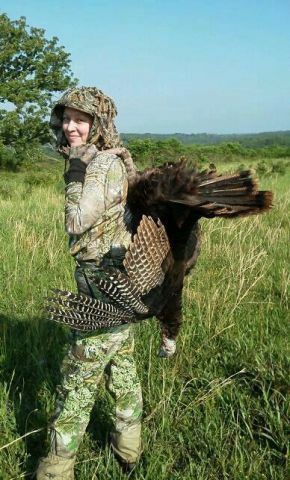 It was the last day of turkey season – my last opportunity to hunt the elusive bird. But, I started thinking … what if it would have been my first day of the season? I would have been in real trouble. We all know the value of keeping our feet blister-free and supported when we’re outdoors. We all do not know the techniques for choosing footwear that supports and protects us. Enter the boot fitting specialists at the Alpine Shop in Columbia, Mo. Adam Nowlin tells customers to remove their shoes and socks, so he can get down to the business at foot. Nowlin, and others at Alpine Shops, have been trained to fit boots according to the Phil Oren’s FitSystem – a six-step program that includes 16-point foot examination, proper sock selection, measurement (both weighted and un-weighted), boot selection, footbed (insole) selection and modification where needed. First, Nowlin examines the feet in question – asking about scars, pressure points, bunions and calluses. Then, he chooses a sock for the activity and season. Nowlin says each foot sweats an average of one cup of water per day. Socks play an integral role in creating the proper fit of a foot in the boot. Nowlin believes cotton is rotten, and says, “In its basic form, cotton should never be worn during an activity. The cotton fiber is so tense that when moisture touches it, it quickly is absorbed by the cotton, and cannot easily escape.” Excess sweat leads to more friction that creates heat and, of course, blisters. According to Nowlin, socks come two categories, both offering moisture wicking: Merino wool and synthetic blends. Nowlin says, “Merino wool fibers are 1/5th the size of a traditional wool fiber, yet still maintain insulating qualities.” He recommends using Merino, which does not have the stereotypical “itch” of other wools, to those who have cold feet or who will be hiking in 50 degree or lower temperatures. Another plus for Merino is its “stink resistance,” says Nowlin. Synthetic socks are made of fibers that are hydrophilic (moisture loving) and hydrophobic (moisture fearing). Nowlin explains, “The former absorbs moisture and the latter quickly moves it into vapor, keeping the foot as dry as possible.” Synthetic socks work well for hikers who typically have warm feet or for those participating in warm-weather activities. After choosing some boot styles, Nowlin then looks over the selection of footbeds (insoles). He says, “Friction in your footwear will causes excess sweating, heat and blistering. So the best fit will stabilize your foot inside your footwear as much as possible, minimizing friction.” Good footbeds generally cost from $25 upward, and may reduce foot shifting from 40 to 60 percent. Nowlin says that since boot manufacturers know that most serious hikers want better-fitting insoles, they put a run-of-the-mill type in the boot. That way, the customer can select his personal choice. Another important feature of a more expensive insole is the attention paid to cushioning the heel. When it comes time to lace the boot, Nowlin asks the customer to stand, because it is important to lace a boot with weight in it. There are a variety of lacing techniques, and a footwear specialist will work with you to find the best one for your foot. Your mom may have put her thumb on the toe of your shoes during fitting, feeling for that half-thumb width of space. Nowlin checks all over the boot – and asks customers to step on the incline bench. On the incline and decline, he checks for volume in the front or back of boot and on the sides. Then, Nowlin gets out the tape and places a piece on each metatarsal area over the boot. Again, the customer goes to the incline/decline set-up and Nowlin checks to see how much movement occurs in each position. In my case, tightening my laces decreased the movement from 1/8 to 1/16 inch. Nowlin says if lacing the boot does not cut down on movement, there are other methods – including a tongue depressor insertion and finding a different footbed. If the boot fits everywhere but one certain area, especially in the toe box, Nowlin and crew can bump out the tight spot, using a special tool. Cleaning your boots will help prolong their longevity. Dirt, grime and wax from former waterproofing applications accumulate and sweat adds to the overall breakdown of materials. Use a boot cleaning product appropriate for whatever material your boot is made from, and then, a conditioner if your boot is leather. An application of Durable Water Repellency (DWR) product seals the seams.